In this second graph, a couple of things are clear. First, a correctly drawn trend line (in this case a 100-month moving average) shows a flattening but no significant decline. Second, the data in the second graph goes a few months further into 2008, where the temperature anomaly as risen, thus “regaining” about 20 years of the supposed 30 that were lost. 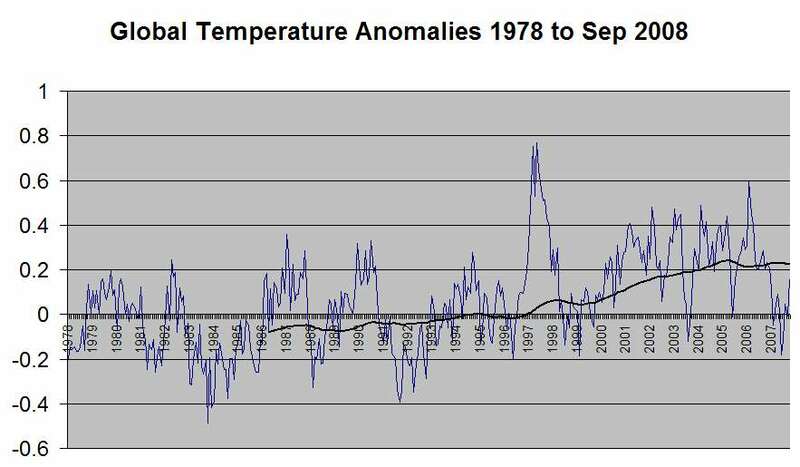 The fallacy of the claim is thus clear: The temperature anomalies move in fairly wide swings. What is important is the rising mean temperature anomaly, not what the level is at any given month. Mr. Gunter, unfortunately, is widely known for his outlandish claims. For a wonderfully detailed and well-linked analysis of other errors in the aforementioned Gunter article, see this greenfyre post. Hang on a sec- why is a 100-month moving average the “correct” one? That’s over 8 years, and an 8-year moving average is going to hide a lot of variation. I’d like to see the 1, 2 and 4 year moving averages including the most recent data. Its the correct one because it most closely approximates the curve of the hand-drawn slop on Mr. Gunther’s chart, and the point of the post was to show the error in his contention that global warming was decreasing over time on the basis of that average. Actually, looking at it again, I think his average in the left 2/3 is probably better fit by an even longer moving average, so I gave him a break. But while we’re on the topic, why would you want shorter moving averages? The trends of global warming cycles occur over decades and centuries, while there are fairly wide swings year to year. The purpose of a long moving average is to smooth out the the year-to-year variation and see the broad trend. I would think if anything 100 months was far too short. This is high school science. You are supposed to ignore outliers. Let’s throw out 1998 and 1984 and redo the line. Not so fast KJ, removal of “outliers” is not at all as widely accepted as you are suggesting, particularly if they are not suspected instrument errors. I see no need to remove them in this case, as while they are extremes the are not abnormally out of range for this temperature. It just has wide variations. But even if we did remove them, I doubt it would make much of a difference since its a moving average and they are short in duration. 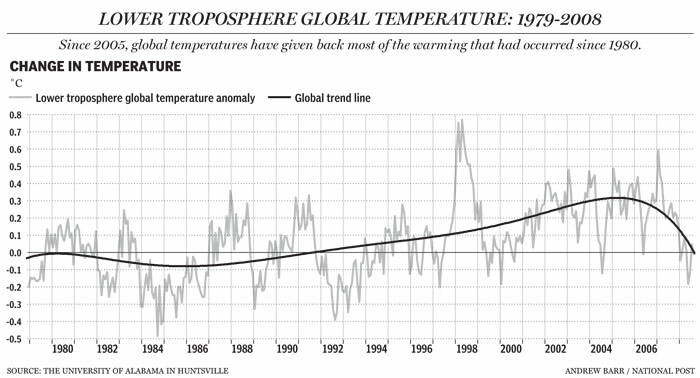 At the end of 2013, the anomoly stood at 0.27C.